I was really looking forward to reading The Year of the Rat by Clare Furniss. I heard that it's a very emotional and beautiful story and I didn't want to let all of my expectations ruin my experience of reading this book... and The Year of the Rat was everything that I was hoping it to be. It is beautiful and emotional and I love that it's a debut book as well. It just means we have so much more amazing to come from Clare Furniss. 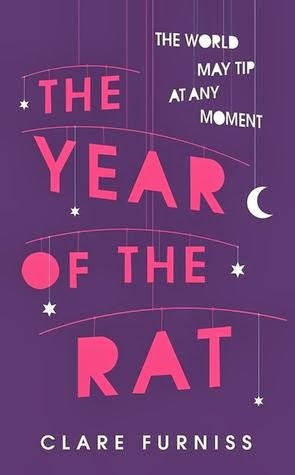 The Year of the Rat is such a simple and very fitting title for this book. It does span an entire year and the rat of the title refers to our main character, Pearl's little sister, Rose, who when she is born at the beginning of the story resembles (in Pearl's eyes) a shriveled little rat. And 'rat' as a nickname is pretty indicative of how Pearl really feels about her new little sister. And that is because Pearl's mother has died in childbirth and Pearl is so sad and angry about the loss of her mother that she needs someone to blame. If not the Rat herself then possibly her dad who she feels might have forced her mother into having another baby. The thing that I loved the most about this book is how complicated Pearl's feelings are. She's dealing with so much during the course of the novel and it was hard not to really sympathise with her and want to give her a hug. She's 15 and suddenly, unexpectedly motherless. While she's never had any doubts about her relationship with her dad, it suddenly becomes painfully obvious that actually he is only her step-father and not biologically related to her and she starts questioning if he will love the new baby more than he loves her or he wants her around at all. My heart broke for this entire family. I love Pearl's anger and her attitude. You can tell that the death of her mother has changed Pearl in this major way and Pearl starts deciding that things that have mattered to her before like her school and her friendship with her best friend just aren't as important when she's so wrapped up in grief. One of my favourite scenes in the whole book is when Pearl is in the garden shouting obscenities at her dead mother. It felt really honest and raw and important. Another one of my favourite things about this book is how Pearl relates to Rose in the beginning. There's this great bit in the book in which Pearl is left to babysit. And during this time Pearl is going through all these thoughts about how she's supposed to feel about a newborn - like she should love and protect her and have all these overwhelmingly positive feelings about her - and Pearl doesn't. She feels kind of a disconnect to her and finds it hugely overwhelming looking after a baby. And what I loved about this is how Clare Furniss has shown a little glimpse of another side to the story that a lot of women go through. This year in Pearl's life is full of its ups and downs and I'm so glad to have read this book and experienced it with her. There are some really wonderful and honest portrayals of families of different kinds, grief and bereavement, and coming to terms with loss but also about friendship and the first hint of falling in love. I really loved this book and I highly recommend that you pick it up! I hope you enjoy it, Lola! Great review, Clover! I'm looking forward to reading this myself :) Really hope I love it as much as you. It does sound a little depressing though. Fingers crossed! It really isn't at all depressing, promise!